On this page we will provide a complete description to integrate AdMob in Android application with smart banner using Eclipse. In our example, we will use one smart banner on footer. Using banner test unit id, we will provide complete running example. After development we need to use actual banner id which will be obtained by signing up in AdMob. We will describe step by step here. 1. Banner has fixed width and height where as smart banner does not have fixed width and height. 2. Smart banner covers complete width of device screen. Height changes according to device height and mobile orientation. 1. Go to Window > Android SDK Manager in eclipse. 2. Install Google Play services which can be found in Extras. The project will be downloaded in C:\Users\<User Name>\android-sdks\extras\google\google_play_services\libproject for Windows OS. 3. Copy google-play-services_lib project in your android application workspace as library project. Copying in same workspace is must. 4. 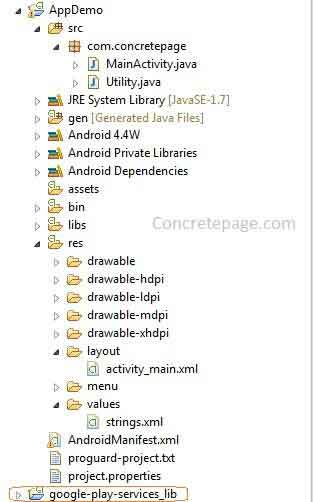 To create google-play-services_lib as library project, right click on this project and go to Properties, search for Android and select Is Library. 5. Now in your android application, add references of google-play-services_lib project. Right click on this project and go to Properties, search for Android. In library zone, add google-play-services_lib. 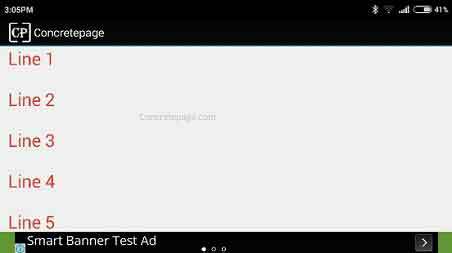 AdMob provides test ad unit id for application development mode. 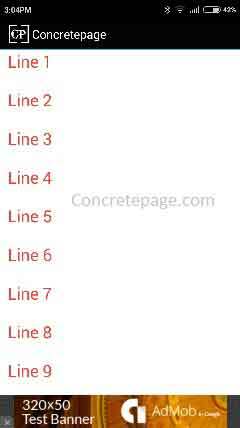 For banner, test ad id is ca-app-pub-3940256099942544/6300978111. After development we need to use actual ad unit id for your application. Find the AdMob URL and sign-up. We must not use actual ad unit id in our development phase. After development phase, we need to replace banner_ad_unit_id value by actual one. Add meta_data within application tag. We need to add below tag in our layout. We can add above tag in header or footer. In our example we are adding it into footer. Find the file. We cannot fix SMART_BANNER height because it changes according to device height and orientation. For orientation change onConfigurationChanged() is called. We will handle all these scenarios in following classes. 1. SMART_BANNER ads for bigger height. 2. SMART_BANNER ads for smaller height.